Companies don’t operate in a vacuum: the success of a business depends on many factors, including the state of natural resources, the level of education and well-being of the work force, and the economic position of consumers. In response to civil society’s concerns about today’s major challenges, such as global warming, the persistence of poverty and increasing inequality, a growing number of companies are taking on board objectives that have traditionally been the province of political authorities in order to contribute to sustainable development. This large-scale movement, which has become an almost compulsory subject of communication for major corporations, is referred to by the generic term “corporate social responsibility” (CSR), defined by the European Commission as “the responsibility of enterprises for their impacts on society”, and as “actions by companies over and above their legal obligations towards society and the environment”1. It goes without saying, however, that this is not the traditional role of companies, focused as they are on growing their business activity and making profits. CSR implies the need for a paradigm shift from the maximisation of shareholder value to taking into account, and even satisfying, broader and more varied interests, rather than just the interests of shareholders. The diverse nature of the demands that companies must meet is embodied by the concept of stakeholders. This concept refers to the people or groups of people that may either affect or be affected by a company’s activities. This of course includes shareholders, but also employees, consumers, NGOs, governments, and so on. It assumes the possibility of achieving a convergence between a company’s economic aims and the different stakeholders’ multiple expectations. CSR is also not incompatible with the goal of profit generation, and is even becoming an increasingly important performance measure. All the stakeholders usually have something to gain from it, starting with companies themselves; cost savings, easier access to capital, a better customer relationship and brand image, improved risk management and an increased capacity for innovation are just some of the tangible benefits offered by CSR. The benefits for society at large are also clear: the involvement of companies as fully-fledged protagonists in the solutions required to meet major international challenges is likely to speed up the pace of the energy transition and the reduction of inequality, for example. As we can see, CSR, and its model built around constellations of stakeholders, is an acknowledgement of the weakening of the state’s ability to regulate multinational corporations, which has increased people’s expectations of these companies in terms of social and environmental cohesion. Companies are now at the centre of a network of diverse relationships where the state, which previously had a monopoly on expressing the general interest, is now only one of many partners. Companies are therefore now being given the role of social regulator, which is all the more important in a context of globalisation that largely makes the economic development process dependent on the internationalisation of large corporations’ production, supply and distribution chains. CSR applies principally to these multinationals, moreover, as can be seen from the main international initiatives introduced in this area. The foremost of these is undoubtedly the United Nations Global Compact, which boasts more than 8,000 participating companies and 4,000 representatives of academic, humanitarian, union and other entities. Also worthy of note are the International Labour Organization’s Tripartite Declaration of Principles concerning Multinational Enterprises and Social Policy, the OECD’s Guidelines for Multinational Enterprises, and the ISO 26000 social responsibility standards, the ISO 14000 environmental management standards and the ISO 50001 energy management standards. More generally, the Sustainable Development Goals (SDGs) identified by the United Nations in 2015 are a major source of inspiration. 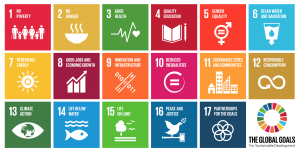 There are 17 of these goals, which are part of the UN’s 2030 Agenda for Sustainable Development and summarise the aims that companies are expected to help achieve. The SDGs have also become a recurring topic of communication in CSR reports. Although these texts and initiatives were introduced by different organisations, they have certain similarities. The main feature that they have in common is that they are not legally binding. As such, they fall into the category of soft law. CSR policies are in fact based mainly on voluntary measures. Companies may, for example, define codes of good conduct and ethics charters, inspired by one or more of the texts referred to above. Other commonly used tools include labelling and certification. A recent study2 by the firm PwC reports that 62% of the companies questioned worldwide now include the SDGs in their public communication. It tempers this finding, however, by pointing out that only 28% of companies have introduced quantifiable objectives that are more than just commitments, showing the limited availability of relevant metrics to provide the data for a real reporting approach. The challenge for companies is to take a proactive approach to meeting social expectations before binding regulations need to be introduced. This gives companies normative autonomy, as they act as sources of law, competing with the state in its legislative prerogative. That said, hard law is currently gaining ground in the CSR field, an eventuality which the Commission does not rule out, on a “complementary” footing. Furthermore, in 2014 the European Union adopted a directive emblematic of this desire to translate CSR into binding regulatory measures, imposing the disclosure of non-financial information by companies with more than 500 employees3. This information, which is usually included in annual management reports, regards measures to protect the environment, improve the treatment of staff, ensure respect for human rights, combat corruption and promote diversity, and especially gender equality within management bodies. Article 1 of the directive states that “where the undertaking does not pursue policies in relation to one or more of those matters, the non-financial statement shall provide a clear and reasoned explanation for not doing so”. This is an example of the “comply or explain” method that is often applied to CSR. To clarify: the directive does not force companies to introduce measures linked to the themes listed, maintaining CSR’s voluntary aspect. It strongly encourages them to, however, as otherwise their reputation would be exposed to public scrutiny. Legally binding measures can in any case make CSR more credible. A purely voluntary approach implies a minimum disclosure obligation and no penalties. This makes it difficult for public authorities to say that the private sector needs to help build a fairer and more sustainable society, while leaving this participation to the discretion of the companies in question. In addition, although CSR is spreading at a fast rate, prompting the creation of dedicated job roles and even departments, it has not supplanted the more or less short-term objective of making profits, which is entirely likely, if no external constraints are imposed, to distract companies away from the long-term perspective inherent in sustainable development. A related risk is of CSR becoming a self-serving tool obeying the purely aesthetic imperatives of image management. Criticisms of greenwashing borne of scepticism about CSR may, however, be countered by pointing out the increasing fastidiousness of the consumers targeted by companies. The youngest age group, the millennials (aged from 18 to 35), are particularly concerned about ethics and demand an authentic commitment from companies in this respect. As these days social media amplify the word-of-mouth effect and can potentially spread outrage to millions of connected consumers (creating a dreaded bad buzz). This is even more true as the public is aware of the intensive regulatory optimisation employed by multinationals and are not fooled by their communication efforts. Tax optimisation and evasion especially, as abundantly documented through the reporting of multiple scandals by the press (such as the Paradise Papers revealed in 2017), have become symbolic of the anti-social behaviour of multinational groups. The optimisation practices used hardly seem compatible with corporate citizenship, given that they encourage states to slash tax rates or employee or environmental protection regulations to stay competitive. It might therefore easily be said that, while many companies may claim to be “good citizens”, they are often lacking in public-spiritedness. Alongside the principles laid down by international organisations and the new non-financial reporting legal obligations, cooperation between governments, on tax particularly, is vital to give substance and authenticity to CSR. The OECD has developed a plan along these lines, to combat the phenomenon of BEPS (Base Erosion and Profit Shifting), which was adopted by the G20 heads of state and governments in November 2015. This plan, composed of 15 measures, is designed to target “tax avoidance strategies that exploit gaps and mismatches in tax rules”, causing a loss for the public finances of between USD 100 and 240 billion a year4. Developing countries are being hit especially hard, as their tax revenue depends on corporate tax more than developed countries. In fact, as consumers are becoming more and more demanding with regard to the ethics promoted and exemplified by brands, and investors are now following their lead, showing enthusiasm for financial products that incorporate sustainable development issues. Socially responsible investing and impact investing have been developing for a number of years as a result. Their aim is to quantify the impact of investments on a given theme, such as access to water or education. The incorporation of non-financial ratings, which offer information about a company’s behaviour, or the environmental, social and governance (ESG) controversies surrounding it, is becoming the norm in the financial industry, supplementing analyses of the risks and opportunities of investments. Although they apply a methodology that is ethical to varying degrees, these investments have the merit of putting pressure on companies when it comes to what, for them, is most important, namely access to financing. If they become more widespread, having an ambitious and sincere CSR policy could become a major advantage when trying to attract capital. Hey Buddy!, I found this information for you: "Can companies be citizens too?". Here is the website link: https://trendsformative.com/can-companies-be-citizens-too/. Thank you.